This Saturday night, March 1st, from the Alamodome in San Antonio, Texas, former WBC Middleweight Champion Julio Cesar Chavez Jr. (47-1-1, 32 KOs) will take on perennial contender Bryan Vera (23-7, 14 KOs) once again and attempt to silence his detractors by defeating “The Warrior“ from Austin, Texas, more definitively in this highly anticipated return bout. On September 28th, the two fan friendly combatants initially squared off at the Stub Hub Center in Carson, California, in a ten round contest that resulted in a controversial unanimous decision victory for the heavily favored Chavez Jr.
Scores from the judges at ringside read: 98-92, 97-93, and 96-94…all score cards were in favor of JCC Jr. 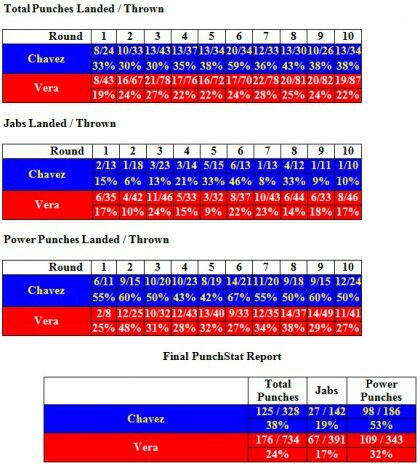 Although the former Middleweight title holder was drastically outworked during his first meeting with Vera, with punch stats throughout the fight overwhelmingly favoring the hard working Texan, Chavez ostensibly landed the harder and more impactful blows; creating a very difficult situation for the judges at ringside. While the son of the Mexican fight legend insists that his sporadic and often minimal punch output was largely due to his poor conditioning and year long absence from the ring, Bryan Vera believes that his opponent is not giving enough credit to the fast combination punching and crafty footwork of the former Contender star. Will the judges be a factor this time in “The Lone Star State” when the dust finally settles from part 2, or will we see a more decisive and definitive ending by way of knock-out? The main event of the evening will be televised on “HBO: World Championship Boxing” with a start time of 9:45 PM EST/PST.